The American Philatelic Society keeps a list of all the upcoming and past stamp issues, back to 2010. A lot of neat stamps coming out this year, really liking the sharks and sport balls. Can't eat too many strawberries anymore... but they still look great on stamps/covers! Stupid me walked right past the dedication ceremony and forgot to walk BACK and watch!! But the USPS had a little table set up and I DID remember to buy the cover later. On May 23, 2017, in Concord, MA, the U.S. Postal Service® will issue the Henry David Thoreau stamp (Forever® priced at 49 cents), in one design, in a pressure-sensitive adhesive (PSA) pane of 20 stamps (Item 475100). The stamp will go on sale nationwide May 23, 2017. With this stamp, the U.S. Postal Service celebrates writer, philosopher, and naturalist Henry David Thoreau (1817–1862) on the bicentennial of his birth. The stamp art is an oil-on-panel painting of Thoreau’s face based on a famous 1856 daguerreotype by Benjamin Maxham. On the right side of the stamp is Thoreau’s signature of his last name. Below the signature is a branch of sumac leaves. With Thoreau’s personal example of simple living, his criticism of materialism, and the timeless questions he raises about the place of the individual in society and humanity‘s role in the natural world, he continues to inspire new generations to assert their independence, reinterpret his legacy, and ask challenging questions of their own. The artist for this stamp was Sam Weber. Art director Greg Breeding designed the stamp. On April 11, 2017, in Rochester, NY, the U.S. 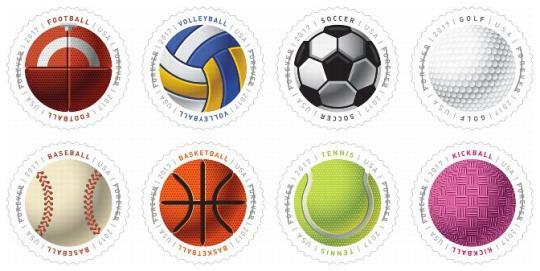 Postal Service® will issue the Robert Panara two ounce rate mail use stamp (Nondenominated, priced at 70 cents) in one design, in a pressure-sensitive (PSA) pane of 20 stamps (Item 114000). The stamp will go on sale nationwide April 11, 2017. The 16th stamp in the Distinguished Americans series honors Robert Panara (1920-2014), an influential teacher and a pioneer in the field of Deaf Studies. The Distingushed Americans series is primarily for rates over the first ounce. The stamp features a photograph of Panara taken in 2009 by Mark Benjamin, official photographer of the National Technical Institute for the Deaf at the Rochester Institute of Technology. Panara is shown signing the word “respect.” Art director Ethel Kessler designed this two ounce stamp. On April 20, 2017, in Albuquerque, NM, the U.S. Postal Service® will issue the Delicioso stamps (Forever® priced at 49 cents), in 6 designs, in a pressure-sensitive adhesive (PSA) booklet of 20 stamps (Item 672700). The stamps will go on sale nationwide April 20, 2017. With the release of the new Delicioso Forever stamps, the U.S. Postal Service celebrates the influence of Central and South American, Mexican, and Caribbean foods and flavors on American cuisine. This booklet of 20 stamps features six dishes from a variety of Latin American culinary traditions that have found new life and variations in the United States. Each stamp showcases a bright and playful illustration of one of the following dishes: tamales, flan, sancocho, empanadas, chile relleno, and ceviche. The names of the six dishes appear in a festive font above each mouthwatering image. Artist John Parra designed the stamp artwork under the direction of Antonio Alcalá. USPS is really making way too many of these cartoonish stickers. Every once in a while, fine, but it's starting to get a little ridiculous. I had bought 5 panes of commemoratives for my mother-in-law to do her mailing. Left them on her dining room table. She thought some kids of guests had left some stickers. She actually threw one of the panes away. I might add that I searched her house and found the remaining 4 panes mixed in the recycle pile! Hey Stamp Bears, that's $49 that almost all got tossed out! Never did find the missing 5th pane. She thinks she threw that one directly into the trash. On April 28, 2017, in San Francisco, CA, the U.S. Postal Service® will issue the Green Succulent Global Forever International rate stamp, in one design, in a pressure-sensitive adhesive (PSA) pane of 10 stamps (Item 564500). The stamp will go on sale nationwide April 28, 2017. Green Succulent is a new Global Forever International rate stamp, which can be used to mail a 1-ounce letter to any country where First-Class Mail International® service is available. The stamp features a photograph of an Echeveria, a succulent native to the Americas. The art director was William J. Gicker. Greg Breeding designed the stamp using an existing photograph by Erika Kirkpatrick. On May 5, 2017, in Acton, MA, the U.S. 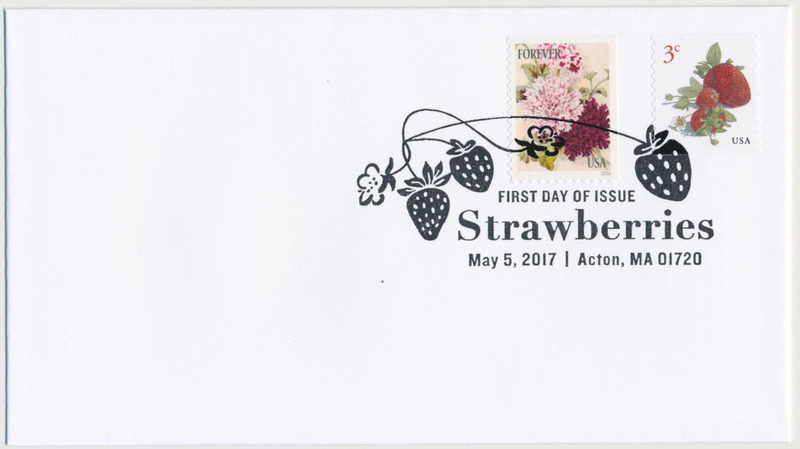 Postal Service® will issue the 3-cent Strawberries stamp, in one design, in a pressure-sensitive adhesive (PSA) coil of 10,000 stamps (Item 760300). The stamp will go on sale nationwide May 5, 2017. In 2017, the U.S. Postal Service will issue Strawberries, a new 3-cent definitive stamp featuring an illustration of three ripe, red strawberries surrounded by leaves and hulls, and three smaller green strawberries in various stages of growth. A small white flower from the strawberry plant completes the picture. Art director Derry Noyes designed this stamp using an existing illustration by John Burgoyne, created with pen, ink, and watercolor. On May 2, 2017, in St. Louis, MO, the U.S. Postal Service® will issue the Celebration Boutonniere First-Class Mail® stamp (Forever® priced at 49 cents), in one design, in a pressure-sensitive adhesive (PSA) pane of 20 stamps (Item 563300). The stamp will go on sale nationwide May 2, 2017. Similar in design to the 2-ounce Celebration Corsage stamp, the Celebration Boutonniere can be used for wedding RSVP cards. It is also perfect for party invitations, thank-you notes, announcements, birthday cards, Father‘s Day cards, and other occasions when a beautiful stamp is fitting. The stamp art features a photograph of an arrangement of Ranunculus with floral accents of succulents, Astrantia, Berzelia, and clubmoss greenery. The ribbon wrapping the stems harmonizes with the colors and textures of the plant material. The boutonniere was arranged by floral designer Carol Caggiano and photographed by Renée Comet. Art director Ethel Kessler designed this stamp. On May 2, 2017, in St. Louis, MO, the U.S. Postal Service® will issue the Celebration Corsage 2-ounce rate mail use stamp (Nondenominated, priced at 70 cents) in one design, in a pressure-sensitive (PSA) pane of 20 stamps (Item 563000). The U.S. Postal Service introduces Celebration Corsage, a new 2-ounce stamp for all of life’s special moments. This beautifully elegant stamp can accommodate the weight of heavy invitations for birthdays, weddings, anniversaries, and other celebrations, oversize greeting cards for all occasions, and mailings such as small gifts that require extra postage. The stamp art features a photograph of an arrangement of Ranunculus with accents of Hypericum Berry, Astrantia, and Seed Eucalyptus. Celebration Corsage is similar in design to the Celebration Boutonniere Forever® stamp, and the two form a natural pair. The corsage was arranged by floral designer Carol Caggiano and photographed by Renée Comet. Art director Ethel Kessler designed the stamp. The USPS has been issuing many stamps in what I call the wall paper series. They must believe people want colorful stamps without regard to the subject. My complaint is the USPS annual program has too many regular issues (Chinese New Year, Christmas and other holidays, some comic book related sheet, etc.) and less historical ones. The Civil War ones could have been better and Star Trek was awful compared to Canadian ones. The USPS has been issuing many stamps in what I call the wall paper series. They must believe people want colorful stamps without regard to the subject. My complaint is the USPS annual program has too many regular issues (Chinese New Year, Christmas and other holidays, some comic book related sheet, etc.) and less historical ones. Of all the recent and forthcoming U.S. announcements you have graciously posted, I can say that I thoroughly approve of five of them. The Mississippi Statehood one is really good and reminds us how much essential American music comes from there. The Nebraska Statehood one is attractive and avoids the temptation to just find another picture of a cornfield and have done with it. I didn't know anything about Robert Panara and he certainly deserves a stamp. I'm not sure we needed another JFK stamp, but this one does capture something about him. And while Henry David Thoreau can be credited with raising irritable self-absorption to a higher level than it might deserve, at least he was really good at it. The Delicioso set is horrible; khj's "cartoonish stickers" snark is on the one. I have never in my life turned down a chile relleno, but this artwork (for lack of a better word) is just brutal. The Civil War ones could have been better and Star Trek was awful compared to Canadian ones. but that's still ridiculous. I agree that the U.S. issue was one of the USPS's less over-achieving moments, but at least I didn't have to rob a gas station to get a sheet. My reference is that USPS Harry Potter issues depicted images of living people but for Star Trek we got some poster looking issues. I am an original (meaning was a fan during network run) Star Trek fan. Star Trek was quite American unlike Harry Potter. I also would prefer the USPS do statehood issues in sheets of 9 different designs to show more aspects of a state. One stamp cannot present a state when the design is so specific - music - and not my first thought of Mississippi. On June 14, 2017, in Hartford, WI, the U.S. Postal Service® will issue the Have a Ball! stamps (Forever® priced at 49 cents), in eight designs, in a pressure-sensitive adhesive (PSA) pane of 16 stamps (Item 474900). The Have a Ball! $7.84 pane of 16 stamps may not be split, and the stamps may not be sold individually. The stamps will go on sale nationwide June 14, 2017. The round Have a Ball! stamps feature a special coating applied to selected areas of the stamps during the printing process to give them a textured feel. Mike Ryan designed the stamps and Greg Breeding served as the art director of the project. Daniel Nyari created the colorful, stylized stamp art. 474906, Press Sheet with Die-cut, $62.72. 474910*, Digital Color Postmark Keepsake (set of 8), $21.95. 474916*, First-Day Cover (set of 8), $7.44. 474921*, Digital Color Postmark (set of 8), $13.12. On June 20, 2017, in Laramie, WY, the U.S. Postal Service® will issue the Total Eclipse of the Sun stamp (Forever® priced at 49 cents), in one design, in a pressure-sensitive adhesive (PSA) pane of 16 stamps (Item 475300). The $7.84 Total Eclipse of the Sun pane of 16 stamps may not be split, and the stamps may not be sold individually. The stamps will go on sale nationwide June 20, 2017. On August 21, 2017, a total solar eclipse will be visible to millions of Americans as it sweeps a narrow path across parts of the entire country. The U.S. 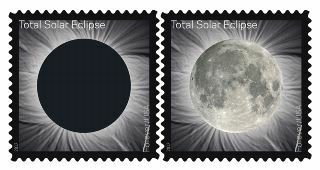 Postal Service anticipates this rare event with a stamp celebrating the majesty of total solar eclipses. A total eclipse of the Sun occurs when the Moon completely blocks the visible solar disk from view, casting a shadow on the Earth. The image on the Total Eclipse of the Sun stamp shows a total solar eclipse that was seen over Jalu, Libya, in 2006. The Total Eclipse of the Sun stamp is the first U.S. stamp to use thermochromic ink, which reacts to the heat of your touch. Placing your finger over the black disc on the stamp causes the ink to change from black to clear to reveal an underlying image of the moon. The image reverts back to the black disc once it cools. The back of the stamp pane shows a map of the eclipse path. Art director Antonio Alcalá designed the stamp with existing photographs taken by astrophysicist Fred Espenak. 475306, Press Sheet with Die-cut, $62.72. 475310*, Digital Color Postmark Keepsake, $9.95. 475321*, Digital Color Postmark, $1.64. 475333*, American Commemorative Collectible Panel, $10.95. Those forevers would look nice on snailmail, although the succulent global forever is nice (received one last week), I like the variation of the forevers. What's the current add-on for 1 forever and 2 forever stamps for international mail? Is it still butterfly non-machinable surcharge and additional ounce penguins for the first weight band? The international first class rate is $1.15.